A beautiful silky scarf, with just a touch of weight, is perfect for your next Italian vacation. Constructed like a stole, this scarf begins with a provisional cast-on. The middle is worked, and then the first lace end. The lace is bound off using a “crochet” chain worked on knitting needles. The provisional cast-on is then picked up and the second end is worked, as for the first end, so that the two ends are symmetrical. This pattern includes full written and charted instructions. Note: If you wish to buy the eBook app for iDevices, please do so before you buy the eBook subscription here! There is a code inside the app to purchase the pdf eBook for $5. If you want the PDF eBook file only as in past years (and you are not interested in purchasing the app), it is available here on Ravelry for $20. The single pattern PDF is available for $6.50. Buy the app from the Apple Store for $24.99. Start the app and enter your name (they just use this to personalize the app; it isn’t shared back to them). On the main screen (where you see Romi and Jeanne’s Cowl) tap the “gear” icon in the upper right corner. Then tap the ‘Sync Options’ icon on the lower right hand side of the screen for the Ravelry Code. Take that Ravelry code and use it when buying the PDF on Ravelry to get the eBook PDF files in your Ravelry library for $5. 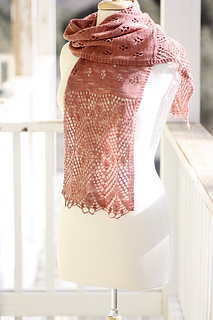 If you buy the PDF on Ravelry without the code you don’t get the discount. The code is IN the app. I first met Teresa online as a member of my very first Pins & Lace Club. She is a screaming fast (and avid) knitter who soon became a test knitter for me. And a friend. Even though we have not yet met in real life, I know that when we do, we’ll stay up until the wee hours solving the problems of the universe. Teresa’s scarf is perfect for her yearly vacation. She loves to knit a little something silky, and in years past, she’s knitted scarves to take. This scarf is constructed with a provisional cast-on, and then one end is knit to the end and bound off. Next, the other end is picked up from the cast-on and worked in the same way, making the scarf symmetrical. Knitting needles are used for the “crochet” chain bind-off. Welcome to year four of my subscription series! 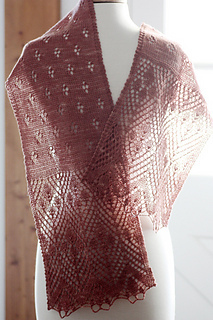 The idea for my first ebook subscription (year one: the pleiades) was born in 2010 while reading posts on Ravelry: people knitting 10 shawls in 2010. 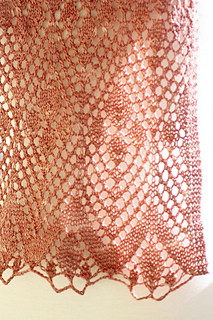 I decided to design and knit 10 shawls that year, and at the time I released my first subscription, I had 7 left to do. I reached my goal that year, and the next year I was back for more challenge. After that, I realized that I simply love doing these subscriptions. I won’t even pretend that there’s any other reason to do them! 7 is one of my favorite numbers, and so I am still doing 7 small (and not so small) shawls with 3 (my other favorite number!) accessories thrown in. When we reached 5,000 people this year, we had a little contest in my Ravelry forum, and so the Year 4 shawls are named after 7 winners, and the accessories are named after…well, you’ll see! I am so looking forward to getting to know the winners a little bit more and coming up with the perfect design for each of them! The patterns for this eBook will be delivered to subscribers within a subscription period ending March 30, 2015. There is no specific delivery time for each pattern. Patterns will have charts and written instructions, and you will be able to make them out of one skein of sock yarn or an amount of sock yarn comparable to that needed for a pair of socks. Some will be two colors, and maybe even three! But you won’t need more than one skein of any color. There will be a few little extras sprinkled throughout and all patterns will be available to purchase separately! As in the past 3 years of subscriptions, the patterns will be sold as an eBook here on Ravelry with the PDF files delivered throughout the year as I release them. 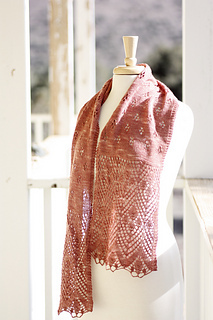 But this year, we have an exciting new way to knit the 7 Small Shawls! Sally slyknits (of knitCompanion fame) and I have teamed up to bring you a Romi App for i-Devices!! Please note that you will still be able to purchase the eBook here exactly as in years past if you do not wish to use the new app. The Y4 app is a separate stand alone app from knitCompanion. Since this is a living app, patterns will be added all year as I release each new offering in the Y4 series. Please note, you do not need to purchase the regular knitCompanion app in order to purchase and take full advantage of Romi’s 7 Small Shawls app and all its capabilities. It is a stand-alone app, and won’t affect or interact with your regular knitCompanion app at all. All patterns will use the knitCompanion capabilities so you never need to lose your spot, and patterns are easy to follow. Patterns will be set up and ready to knit, with options like charts, sizes, etc (as appropriate). No setup work on your part required! Video by me (Romi), offered only through the app for special techniques required by each design. Video will be linked in the pattern right where it is needed. And is is indexed for easy access as well. If you purchase the app you will get a Ravelry discount code so you can add the PDF to your Ravelry library for only $5 if you would like that as well. (Note, if you don’t want the app, you can always purchase just the PDF at its listed price). This app will only work on Apple i-Devices, it will not work on Apple Macs, Windows or Android phones, etc. Sally is working on a version of knitCompanion for Android, but it isn’t there yet. The app will work with any iDevice that is iOS 6 or later (i-Pad and i-Pad mini preferable so you can see the charts). The only i-Pad that can’t be upgraded to iOS 6 is the original iPad, aka iPad 1. You can see your iOS version on your iPad under Settings, Version. Note that purchasing the eBook represents a significant discount over purchasing each pattern separately. No refunds can be given for buying the patterns separately and then, at a later date, purchasing the complete eBook. If you have made a single pattern purchase in error and wished to purchase the book instead, please contact me within a week to resolve the issue. Thank you!